We want our children to begin to acquire the skills, concepts, attitudes and values needed to lead independent lives, benefiting from and contributing to society. *All children are supported and encouraged to reach their full potential. *We promote attitudes of mutual respect and responsibility within a disciplined yet caring environment. *Havergal values strong links between the school, home, Church and community, promoting care, courtesy and consideration. *The spiritual development of everyone in the school community is important, and worship plays a significant part in this. *Christian values are built into the ethos and teaching of the school, with the support of the Governors and staff, yet an understanding of and respect for other faiths and cultures is included. We believe that there continues to be value in the link between the church and education and that this is seen most clearly in the work of Church Schools. We believe that the spiritual dimension in human lives needs to be nurtured and encouraged and that this can best be provided through the Christian Faith. We believe that a church school should provide the best possible education within the framework of, and in to, the local Christian community. With these things in mind, we see our role in terms of sharing with the children our own understanding of what education – in its broadest sense, and Christianity as proclaimed by the Anglican Church – means for us. We therefore commit ourselves to attaining the highest academic standard through the twin pillars of sound learning practices and valuing personal faith in Jesus Christ set within the secure and loving environment which will enable all pupils to realise their full potential in all aspects of school life. 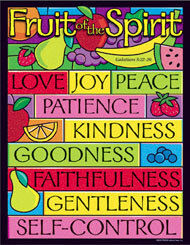 The Christian values that we share at Havergal Church of England Primary School are based on The Fruits of the Spirit. We show our love to all those who have a part to play in the Church and Community. These include; children, parents, teachers, non-teaching staff, Governors, visitors and helpers. There are many times when we share happy events, special occasions, and the achievements of others. We aim to show peace in the way in which we conduct ourselves and the way we treat each other, including those who may have hurt us. We thank God for the time he gives us – our todays and our tomorrows. We try not to wish our time away but to enjoy the time we are at now. We show kindness to all who are associated with the school in any way. We are kind to those who need our help. We aim to treat others with the kind of goodness that Jesus showed when he was on Earth. As members of a Church School, we show others that we have faith by the way in which we live our lives each day. We care for all those in need, whoever and wherever they may be. We show care for God’s work. Within and outside the school we demonstrate discipline and self-control at all times.